'Houlgate' is a large Impressionist oil on canvas seascape painting created by French artist Christian Nepo in the 21st century. 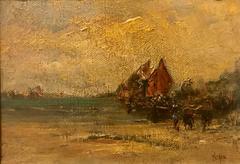 Featuring a palette made of pink, cream, blue, grey and orange tones, the painting captivates us with its romantic depiction of masted ships beached along the sandy shore, a few villagers are engaged in various tasks next to it. Bathed in a poetic light, this vertical oil on canvas painting, created a decade before Nepo's passing, is signed lower left. A fourth-generation French artist, Christian Nepo had art in his blood. His great grandfather was Ivan Chichkine, a noted Russian painter whose works hangs in a Museum of St. Petersburg. A student of Impressionism and an advocate of “en plein air” paintings, Nepo (as he signed his paintings) began painting seascapes and beach scenes during his frequent holidays on the coasts of Normandy and Brittany. Many of his paintings are reminiscent of pre-impressionist work: ominous skies, perfectly captured light, delicate brushwork and plenty of pure color, all inspired by plein air painting.